It is impossible to live in Toronto without having a proper and effective furnace system in place as a heating option. No matter what size your home might be, the cost of doing up the entire heating system with furnace would cost a bomb. In such cases, it is advisable that one opts for a rent to own option as compared to buying them. 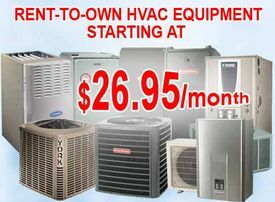 These rent to own options are a great way to heat your home without feeling the pinch in your pocket. There are many online websites that offer rent to own Furnace In Toronto .They offer all kinds of furnaces like gas furnace Toronto and so on as ready to rent options. The best parts being these rents to own furnaces in Toronto come in a complete package. The furnace installation packages enclose rental as well as installation charges. These rent to own furnaces can be rented out at a paltry sum of $2500 approx. on a monthly basis. This is nothing compared to the cost you would incur while installing a heating and cooling system at home. The http://www.acfurnacegta.ca/service/ac-furnace-rent-to-own/ is a great place to shop if you are thinking of installing or buying a new furnace. There are various kinds of options available for you to try from. You can either rent to own a furnace. This is almost like leasing out a car. You get to enjoy 24 x 7 hours of the furnace by paying a monthly fee. If renting is not the option then you can buy a new furnace in Toronto by exchanging your old one. In exchange of the old one, you can get a rebate on the new furnace’s price. In short it’s a win win situation for you. In case, you want to repair an old existing furnace then also, they have specialists who work round the clock to repair your old furnace. They specialize is repairing almost all kinds of furnaces and the best aspect being that no matter what the problem with your furnace might be, they have just the right advice for you. These repairs Centre’s have various kinds of annual maintenance packages. Enrolling in these annual maintenance packages ensures that you have no head ache for your furnace. No matter what might be the problem with your furnace, this annual maintenance package will take care of all the issues and damages. That’s not all, the portal offers various kinds of sales and offers on Toronto furnaces round the year. These offers are lucrative and exciting. In short, this website ensures that your entire furnace related issues and problems get resolved in a jiffy without any kind of problem. There are various solutions for various kinds of people. If you want renting options you can rent them, if you want to buy new ones you can, if you want to exchange old ones for new ones you can do so and lastly you can repair old and damaged furnaces. Take a look at this website and discover a whole new world.